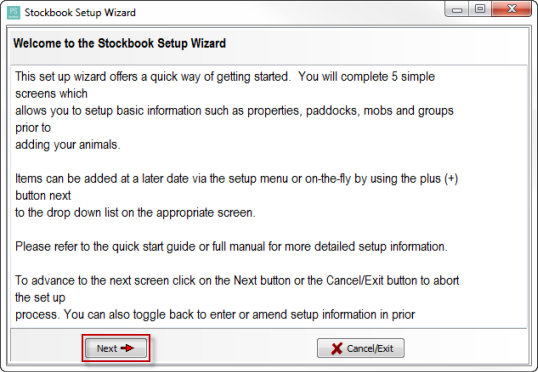 How do I setup Stockbook using the Setup Wizard? The set up wizard offers a quick way of getting started. 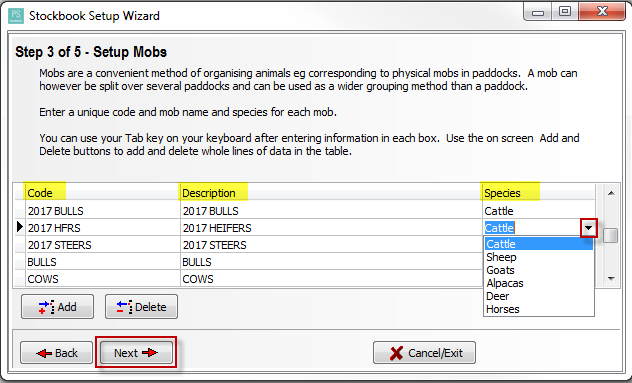 You will complete 5 simple screens which allows you to setup basic information such as properties, paddocks, mobs and groups prior to adding your animals. Items can be added at a later date via the setup menu or on-the-fly by using the plus (+) button next to the drop down list on the appropriate screen. Please refer to the quick start guide or full manual for more detailed setup information. If not automatically prompted, click on Setup > Setup Wizard menu option. Every animal on file can be assigned to a property and a paddock. 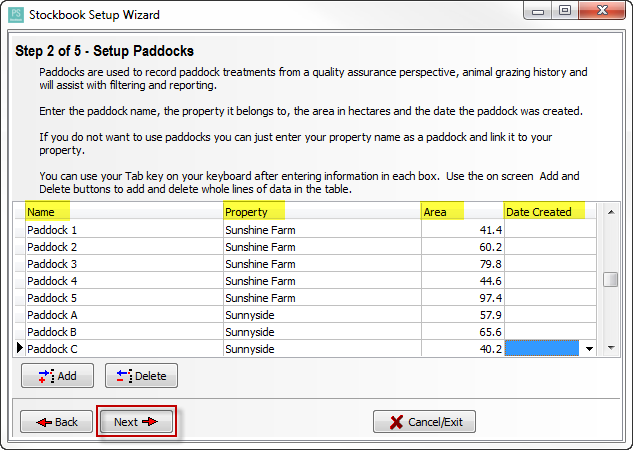 Although paddocks are optional, if using paddocks they can be linked to a property. You can use your Tab key on your keyboard after entering information in each text box. Use the on screen Add and Delete buttons to add and delete whole lines of data in the table. Click on your Tab key on your keyboard to move to next text box. Note: A Property Identification Code (PIC) is an eight-character code allocated by the Department of Primary Industries (DPI) or an equivalent authority in each state or territory to identify a livestock-producing property. The PIC forms the basis of Australia's food safety and traceability programs. Repeat process for each property. Click Next button to accept data and to continue to Step 2. Enter the paddock name, the property it belongs to, the area in hectares and the date the paddock was created. 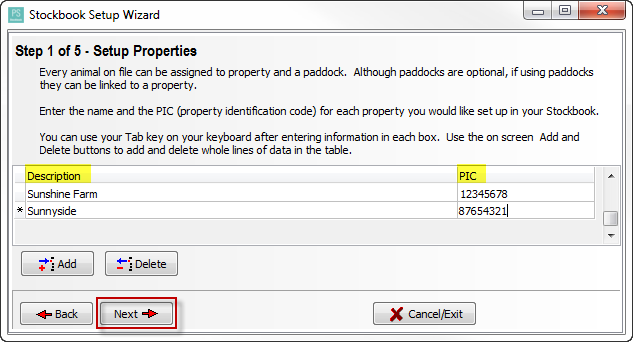 If you do not want to use paddocks you can just enter your property name as a paddock and link it to your property. Property - every paddock must be linked to a property. Select the property from the drop-down list. Creation Date - this is optional unless you have Stockbook linked to Farmbook. Repeat process for each paddock. Click Next button to accept data and to continue to Step 3. Note: use the on screen Add and Delete buttons to add and delete whole lines of data in the table. Mobs are a convenient method of organising animals e.g. corresponding to physical mobs in paddocks. A mob can however be split over several paddocks and can be used as a wider grouping method that a paddock. Enter a unique code and mob name and species for each mob. Enter the mob name in the Description column. e.g 2017 HEIFERS. Click on the drop-down arrow to select a Species. e.g. Cattle. Click Next button to accept data and to continue to Step 4. Groups are a convenient methd of roganising animals outside a paddock or mob. A group could be set up for a particular management purpose, eg. Bredding Cows or Sale Bulls. 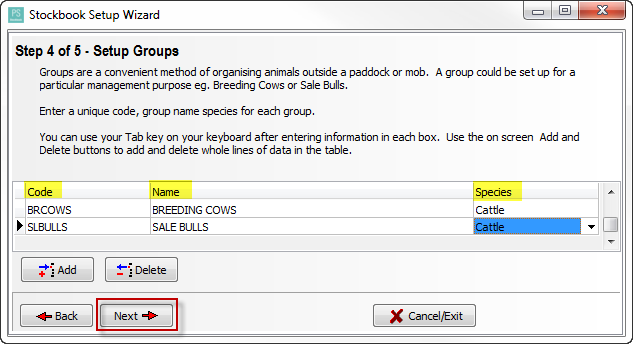 Enter a unique code, group name and species for each group. Enter the group name in the Description column. e.g BREEDING COWS. Click Next button to accept data and to continue to Step 5. You can enter a Commerical animal ID. 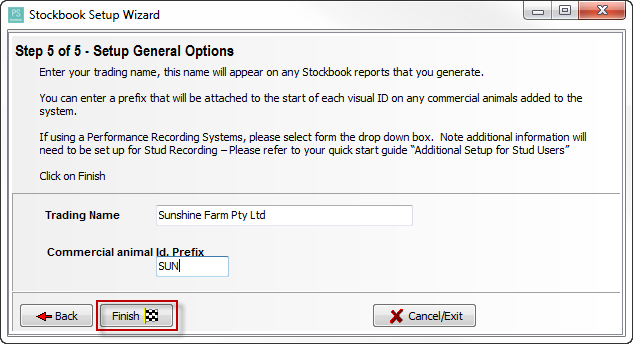 Prefix that will be attached to the start of each visual ID on any commercial animals added to the system.